Hyrogage, Inc., is a unique Florida-based corporation that provides sales, rental, and installation services of water resources and environmental equipment to industry, agriculture, consultants, and government agencies. Hydrogage, Inc., has been established in Florida since 1989 and is a SFWMD-certified SBE. 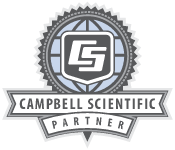 As a Campbell Scientific integrator, we can program and install stand-alone or telemetry instruments. Campbell dataloggers can input and store the following sensor data: groundwater and surface water level, water flow, meteorological parameters, alternate energy output and efficiency, construction and structure monitoring, lightning prediction and warning systems, and water- and air-quality sensors and samplers. Hydrogage can help design your monitoring network to collect the exact parameters at the frequency you need. Hydrogage provides light to heavy construction and installation services, having a Florida-licensed general contractor on staff. Our streamgaging services provide USGS quality data collection and surface water records processing including: Doppler streamgaging, rating curve development, daily and unit flow computations, and annual station analysis and database input. Hydrogage service contracts will provide the client with data collection and reporting in accordance with their needs and the requirements of regulatory agencies.